Skye Gravestones | John & Catherine (Ross) Cameron. & family. John & Catherine (Ross) Cameron. & family. In memory of/JOHN CAMERON/who died/on the 10th October 1873/aged 75 years/and his manly worth/kindness to the poor and/distressed, hospitality and/labours of love as member/and elder of the Free church/. also of his wife/CATHERINE ROSS/who died/on the 2nd October 1859/aged 47 years/and who was by word and/example, living epistle/of Christ to his children/and to all around her. Five infant children/are also buried here. There remaineth therefore a rest/to the people of God. AEXANDER CAMERON/second son of/JOHN CAMERON/procurator fiscal, Portree/author of/history and tradition/of the Isle of Skye/died on the 16th January 1872/aged 31 years/beloved by all who knew him/His life was bright with promise/his death cheered by the/Christian's hope. MARY ANN MACLACHLAN/his wife/died on the 24th June 1875/aged 35 years/DUNCAN and ALICK/two of their young children are buried here/JOHN DONALD/their eldest child/in Lochmaddy/CATHERINE ROSS/their only daughter/died in Edinburgh/on the 30th October 1920/aged 88 years/buried in Morningside Cemetery. Whether we live therefore/or die we are the Lord's Rom. XIV.8. MARION CAMERON/eldest daughter of/JOHN CAMERON/and wife of the/Revd. 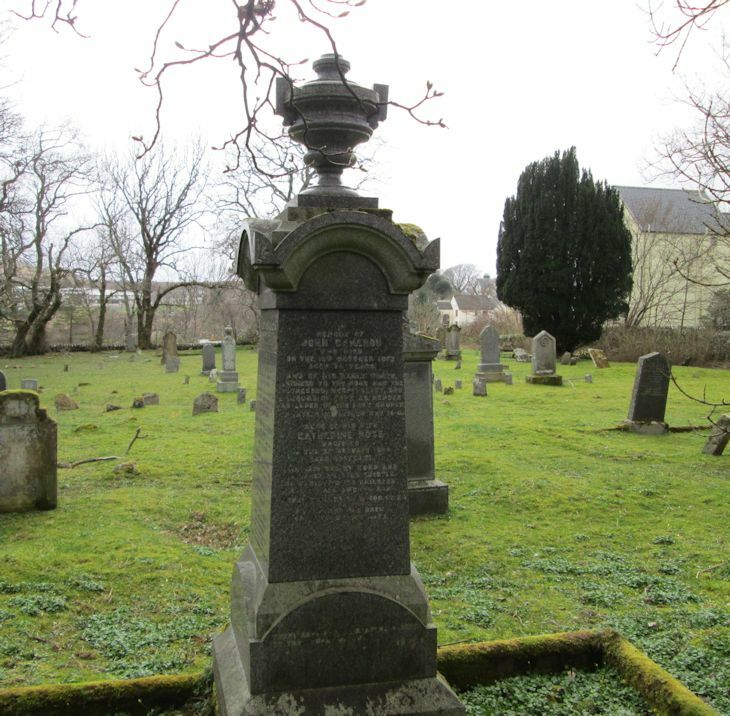 ALEXANDER MACKENZIE/died on the 29th November 1875/aged 40 years/her remains lie in another/part of this churchyard/JAMES/their second son/and an infant daughter/are buried here. And God shall wipe away all/tears from their eyes.Rev. VII. 17. Picture Added on 13 April 2014. Born 1794–1801, Strontian, Ardnamurchan, Argyll-shire, SCotland. Added by Gordon J Callon on 18 June 2016. Born 1813–1816, Lochcarron, Ross-shire, Scotland. Born 1840–1841, Portree, Inverness-shire, Scotland. Born 1840–1841, Tobermory, Argyll-shire, Scotland. 1861, at Breadalbane Street: Niel MacKinnon, 45 (b. c. 1816, Tobermory), General Merchant; Margarey MacKinnon, 22 (b. c. 1839, Tobermory), Wife; Mary MacKinnon, 49 (b. c. 1812, Tobermory), Sister, Schoolmaster; Ann MacKinnon, 47 (b. c. 1814, Tobermory), Sister; Mary Ann MacLachlan, 21 (b. c. 1840, Tobermory), Sister-in-law, Assistant Teacher; Kathrine McKenzie McKinnon, 2 (b. c. 1859, Tobermory), Daughter, Scholar. The 1871 Scotland Census lists the family of Alexander Cameron & Mary Ann MacLachlan, living at the Procurator Fiscal's House, North Uist, Inverness-shire, as: Alexander Cameron, 30 (b. c. 1841, Portree), Scholar & Procurator Fiscal; Mary Anne MacLachlan Cameron, 30 (b. c. 1841, Tobermory); Catherine Ross Cameron, 2 (b. c. 1869, Lochmaddy, North Uist, Inverness-shire); Donald [Dugald] Gregorson Cameron, 2 Mo (b. c. 1871, Lochmaddy). Birth: Catharine Ross Cameron, Female, 3 May 1868, North Uist, Inverness-shire, Scotland; Father: Alexander Cameron; Mother: Mary Ann Maclachlan. Born 1835–1836, Portree, Inverness-shire, Scotland. Born about 1869, Strath, Inverness-shire, Scotland. The 1871 Scotland Census lists Alexander MacKenzie & Marion Cameron's family, at the F L Manse in the Parish of Strath, Inverness-shire, as: Alex Mckenzie, 43 (b. c. 1828, Knock, Lewis, Ross-shire), F L Minister of Strath; Marion Mckenzie, 36 (b. c. 1835, Portree); Murdo John Mckenzie, 3 (b. c. 1868, Strath); James Mckenzie, 2 (b. c. 1869, Strath); John Mckenzie, 7 Mo (b. c. 1870, Strath). 1861, at 10 Bosville Terrace: John Cameron, 60 (b. c. 1801, Ardnamurchan, Argyll-shire), General Merchant; Alexander Cameron, 20 (b. c. 1841, Portree), Clerk; Jessie Cameron, 18 (b. c. 1843, Portree), Housekeeper; John Cameron, 16 (b. c. 1845, Portree), Apprentice Bank Clerk; Ann Cameron, 5 (b. c. 1856, Portree), Scholar; Lewis A Neckers, 76 (b. c. 1785, Switzerland), Boarder, Professor of Geology & Mineralogy.